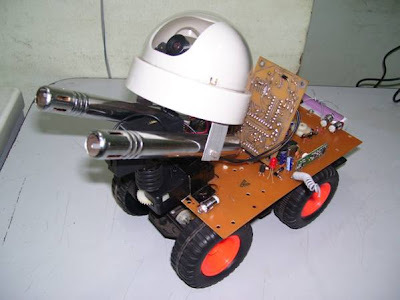 Radio Controlled Combat Robot project can be efficiently used for tackling with terrorist and helping people. It has got two barrel turret through bullet can be fired, radio camera in synchronization with the turret can rotate up and down ,left and right up to a safe firing limit. This robot is radio operated, self powered, very normal controls. To fight with terrorist a laser gun has been installed with a wireless camera to see enemy. You can also Subscribe to FINAL YEAR PROJECT'S by Email.